We offer riding lessons for young children (starting at 5 years old) as well as adults of all ages. Since our lesson schedule will vary from season to season, please contact us to schedule your first lesson. Each lesson is customized to the riding level of each rider. Lessons are $45/hour with a 10% discount per lesson offered if lessons are paid for monthly rather than weekly. Barn time is offered at $20/hour to lesson students, Pony Club, and PonyPal members. Barn time and arena time are offered on Thursday nights from 6-7pm (excluding the first Thursday of each month, our regularly scheduled PC/PP meeting night). Pony Club and PonyPal Program members can use barn time to work with horses/ponies in hand in the arena, hand grazing, grooming, etc. (no riding) Cost is $20 per session attended. (During the year we may offer some select Barn Days when kids are off from school too … check our events calendar for dates & details.) Arena time will be scheduled as the need arises. Arena time is for lesson students who have completed 6 or more riding lessons. Arena time will give lesson students the opportunity to practice their riding skills and/or ride with friends. Cost is $35 per session attended. Full payment is due the day of your riding lesson/barn time. Refunds will only be provided for cancellations 24 hours or more in advance. Considerable time goes into planning lessons with instructors and reserving horses for riders, therefore it is the responsibility of the rider to come to lessons and be on time. We offer a simple, partial leasing program of our horses and ponies. Leasing a horse is a good way for riders and Pony Club members to get extra practice and experience in between their regularly scheduled lessons. It also shows parents if their child has the dedication to eventually own their own horse. 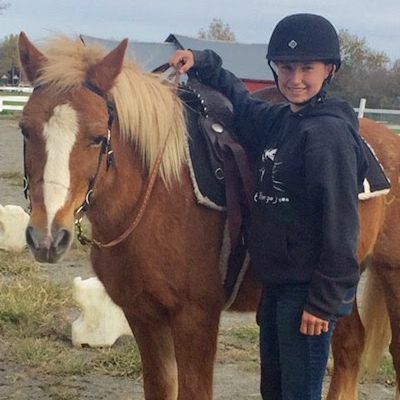 Although leases do not include any riding lessons, leasees may attend scheduled weekly Barn Days at no charge. Leases are available on a first come basis. Preference is given to our PonyPals and Pony Club members and to our riding lesson students. When choosing a horse to lease it is important to match the riders experience level with that of the horse. Parents who lease a horse for their child must be active participants in helping their child learn and perform horse ownership chores — leasing is not a drop-off activity! We are unable to supervise a child while at the barn, and parents are responsible to monitor their child’s activities. Leasing gives you a horse of your own for most of the week, including preferred use of that horse for your riding lessons & other programs. Horses are not available for your use during our lesson and Pony Club meeting times. Through the lease, you may groom, ride, and just hang out to love the horse. 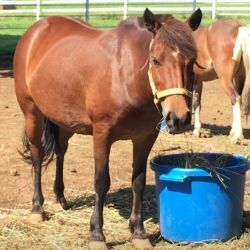 Leased horses may not leave the farm or be ridden by others. Other such rules may also apply. Leases may be done on a 1-, 3-, 6- or 12-month basis, with a 30-day trial period. Leasees must agree to all of VonThun Farms riding and horse care expectations.